Do we need an ‘app’ for mindfulness? Although BlackBerry called time on its plummeting hardware business in September 2016, a licensing deal with China’s TCL Communications means the BlackBerry hardware brand lives on. In a market of me-too handsets, BlackBerry has tried hard to deliver on the promise of a distinctly different smartphone: Inspect-a-Gadget thinks it succeeds. BlackBerry Mobile clearly believes that keys are the key to regaining its loyal customer base. Known as the BlackBerry Mercury when it first trailed at CES in January, the TCL partnership focused its marketing and by the time the handset was fully unveiled at Mobile World Congress in February it had become the BlackBerry KEYone. The four-row physical keyboard is tightly stacked beneath a modest 4.5-inch IPS LCD display, ensuring both content creation and consumption are – depending on your viewpoint – equally compromised or catered for. However, BlackBerry is quick to point out that a physical off-screen keyboard can mean more on-screen real-estate than on larger-screened devices where a touch keyboard can fill half the display. BlackBerry has once again imbued its hardware keyboard with some software smarts: app-launching short-cuts, swipe navigation and flick typing are joined for the first time by an unobtrusive fingerprint sensor on the spacebar. Of course, keyboard preferences are highly personal, and changes as fundamental as how you input text and navigate around a device can take a while to bed in; those upgrading from a previous qwerty-equipped BlackBerry will take little time to adjust, but those who have grown used to – or always have always used – a touchscreen keyboard may take longer. Alongside its keyboard, the standout features of the KEYone are its security and design. 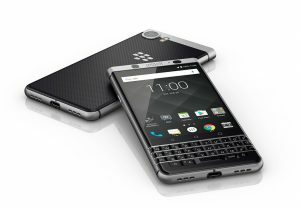 BlackBerry Mobile claims the KEYone is the most secure Android handset in the world, and while the firm has long tolled the smartphone security bell, perhaps never more than now has that note rung as clear. Android 7.1 Nougat comes as standard, along with access to over a million apps from the Google Play store. As with its previous Android handsets, BlackBerry’s DTEK software is in place, adding a convenient layer of permissions visibility and control across all applications. An eye-catching feature is the BlackBerry Privacy Shade app, a screen overlay which keeps prying eyes at bay by darkening the entire screen except for a small movable cursor. The BlackBerry Hub universal inbox, familiar to BlackBerry users of old, is welcome here too. BlackBerry Mobile’s Global Head of Device Portfolio, Gareth Hurn said that “Secure software is integrated into the chipset and locked long before it gets near to the assembly line,” no doubt alluding to reports of smartphones and PCs being infected with malware during assembly. BlackBerry has also committed to monthly Android security updates for at least two years. At the London launch event, BlackBerry Mobile bosses were at pains to impress how the KEYone has been styled for the professional consumer, and the feel is very much that of a premium device. Alongside the intricate keyboard detailing, the strong aluminium chassis is fronted by a scratch-resistant 4.5-inch Gorilla Glass screen protecting a 1620 x 1080 IPS LCD display. To the rear is a grippy textured soft-touch shell, a pleasant change from the oh-so-slippy metal or glass back found on many other devices. The KEYone is a phone that feels like it doesn’t want or need a case for extra protection. The KEYone camps in an appealing middle ground between a standard and a plus-sized body. At 149.3 mm tall and 73.5 mm wide its dimension are almost exactly midway between an iPhone 7 and iPhone 7 Plus, though the extra few millimetres of depth are noticeable. The handset feels well proportioned and weighted though sadly, there’s no water-resistance here. Beneath its shell, the KEYone is powered by an octa-core Qualcomm SnapDragon 625 processor clocked at 2.0 GHz, together with 3 GB of RAM and 32 GB of flash storage. Storage can be expanded by up to 2 TB with supported microSD media. On paper, some of these specs do sit towards the middle of the road but in practice, the software feels perfectly responsive when swiping between screens and opening apps. A USB Type-C port sees to power and wired connectivity, and the non-removable 3,505 mAh battery claims 26 hours of mixed use. What’s more, QuickCharge 3.0 technology means a 50% charge can be achieved in as little as 36 minutes. Unfortunately, there’s no space here for wireless charging. The Inspector hasn’t put the KEYone’s power claims to the test yet, but longevity along these lines is most welcome in any wannabe workhorse device. 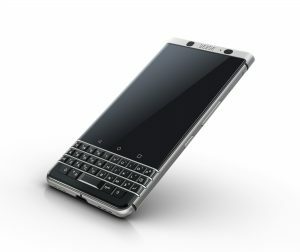 Content creation isn’t limited to the keyboard: the BlackBerry KEYone camera specifications are a pleasant surprise and may help broaden its appeal: the rear-facing sensor is the same top-drawer 12-megapixel Sony IMX378 unit we saw in the Google Pixel XL, complete with its 6-element f/2.0 lens, dual tone LED flash and fast phase-detect autofocus. Video recording clocks in at up to 4K at 30 fps. If you feel the urge to snap a selfie, the front-facing is an 8-megapixel sensor with an 84-inch wide-angle lens and light-up LCD flash. The BlackBerry KEYone launches today in the UK and is available in-store exclusively from Selfridges on Oxford Street in London priced at £499. The KEYone goes on sale in Carphone Warehouse stores from 5th May and other with mobile networks shortly afterwards, although many online stores are offering preorders right now. Details of launches in other territories will follow. So far, the Inspector is impressed. One could pick out the lack of water resistance or wireless charging as minor faults, but the truth is that the KEYone is a solid professional smartphone with the potential to be the productivity workhorse many may feel they’ve been missing.